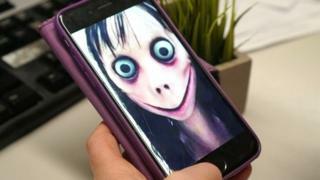 The fictional online character “Momo”, which was alleged to have encouraged children to self-harm, has been described as a hoax. Earlier this week, the police in Northern Ireland said that while headlines like “suicide game hits UK” might get thousands of clicks online, they “miss the bigger issue”. “Great for a short-term shock effect, but not great long-term as it somewhat misses the bigger issue,” said the PSNI in Craigavon in a Facebook post, which has since been deleted. A police officer claimed Momo was “run by hackers” seeking information. The PSNI has said the danger lay with children feeling pressured to either follow the orders on any app by carrying out “challenges”, or because of peer pressure in chat rooms. “This is merely a current, attention-grabbing example of the minefield that is online communication for kids,” read the original PSNI Facebook post. Police in the Republic of Ireland also raised concerns about momo, appealing to adults to supervise children and vulnerable people’s online activity. Update 28 February 2019: This article was originally published on 26 February and has been updated to reflect that fact-checkers now say that aspects of the “Momo” story is a hoax.